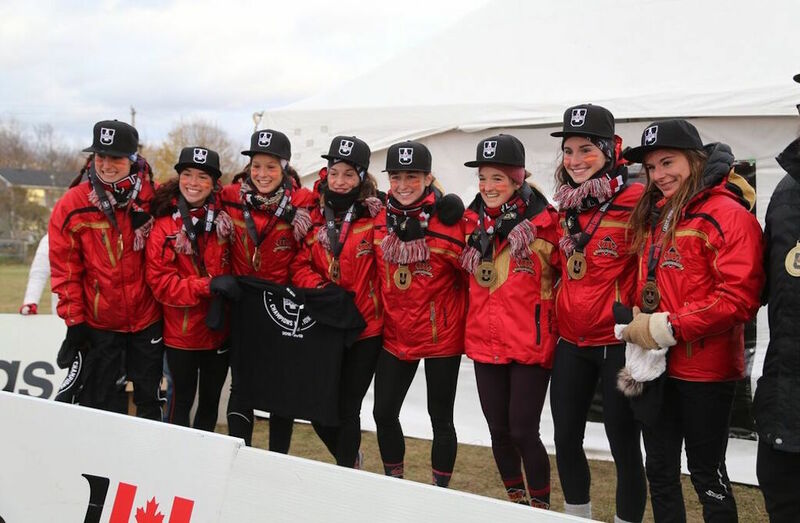 The U SPORTS cross country national championships were hosted by the Queen’s Gaels for the first time this year, at the Fort Henry Hill course in Kingston on Saturday. And they saw a pair of teams win their first-ever national titles at this level. On the women’s side, that was the Laval Rouge et Or, who finished with 55 points thanks to second- and third-place performances respectively by Aurélie Dubé-Lavoie and Catherine Beauchemin, plus sixth- and seventh-place showings from Anne-Marie Comeau and Jessy Lacourse (good enough for the first-team All-Canadian status awarded to the top seven finishers) and a 37th-place finish from rookie Jade Bérube. That put them seven points clear of Queen’s and 55 points clear of the third-place Guelph Gryphons. But the Gaels saw several notable individual showings, including first overall from rookie Brogan MacDougall (who added athlete of the year to her rookie of the year award) and ninth overall from her sister Branna. A full recap of the women’s race can be found here. On the men’s side, it was the Calgary Dinos who came out on top, thanks to a third-place finish from Russell Pennock, ninth- and 10th-place finishes from Eric Lutz and Stefan Daniel (good enough for second-team All-Canadian status), and 21st- and 32nd-place finishes from Ryan Grieco and Tyler Kiyonaga. That put Calgary at 75 points, 14 ahead of the second-place Gryphons and 19 ahead of the McMaster Marauders. Guelph’s Connor Black won the individual title with a 31:13 time, narrowly edging out Laval’s Jean-Simon Desgagnés by a fraction of a second in a wild finish. A full recap of the men’s race can be found here. That marked Ottawa’s second national championship ever in women’s soccer, and their first since 1996. A full gold-medal game recap can be found here. 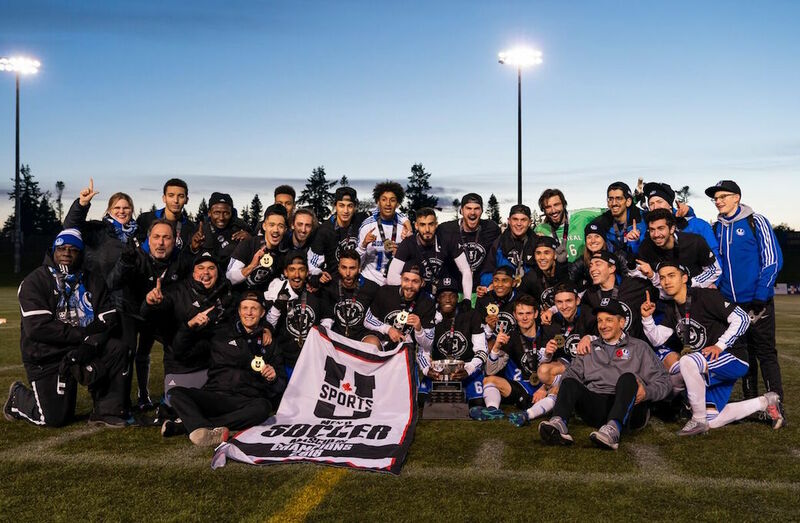 The men’s soccer national championships this weekend at UBC saw some drama in Sunday’s gold-medal game, with the Montreal Carabins edging the Cape Breton Capers 2-1 in extra time. That was a rematch of last year’s championship game, which saw Cape Breton beat Montreal 3-2 on penalty kicks. The Carabins got off to a great start in this one thanks to a goal on a one-touch volley from Guy-Frank Essomé Penda, which came off a long ball from Kareem Sow. However, Caelann Budhoo equalized for the Capers late in the first half after beating three defenders, and while both sides had some solid second-half chances, the game went to extra time deadlocked at 1. In the first half of extra time, Cape Breton defender (and AUS MVP) Peter Schaale was ejected for a second yellow card, giving Montreal a man advantage, and the Carabins capitalized in the 109th minute when Omar Kreim beat Capers’ midfielder Lewis White with some fancy footwork and laid it off to tournament MVP Frédéric Lajoie-Gravelle for the match-winning goal. This marked the second U SPORTS championship for Montreal head coach Pat Raimondo, who previously won a national title in 1997 as head coach of the McGill Redmen. A full recap of the championship game can be found here. The football conference championships took place this weekend, and perhaps the most surprising result came in Calgary. There, the No. 3 Dinos lost 43-18 at home to the No. 6 Saskatchewan Huskies in the Hardy Cup, the Canada West championship. The defence was critical for the Huskies in that one, picking off Dinos’ quarterback Adam Sinagra four times. Fifth-year Saskatchewan running back Tyler Chow also collected 222 yards and two touchdowns on just 24 carries (an average of 9.3 yards per carry), the third-highest rushing total in Huskies’ history. The Huskies got this one off to an excellent start defensively, with Josh Hagerty intercepting Sinagra on Calgary’s first offensive play. (And that came after a stalled Saskatchewan drive and a blocked punt put the Dinos in good field position.) There wasn’t much offence on either side until the second quarter, but Huskies’ running back Colton Klassen turned in an impressive sequence there, catching a pass for 53 yards and then rushing for a one-yard touchdown that put Saskatchewan up 8-1. Calgary struck back to tie the game after that, but the Huskies then added a field goal. After that, Saskatchewan’s Nelson Lokombo returned an interception to the Dinos’ one-yard line, setting up a one-yard touchdown plunge from Chow that made it 18-8. Calgary cut that lead to 18-15 by the half, but the Huskies took over after the break and won decisively in the end. They’ll face the No. 1 Western Mustangs (who dismantled the No. 5 Guelph Gryphons 63-14 to win the Yates Cup as OUA champions) on the road in the Mitchell Bowl (the western semifinal) next week. In Atlantic Canada, the No. 9 Saint Mary’s Huskies went 7-1 this year and earned both a first-round bye and the right to host the Loney Bowl (the AUS conference championship), but it was the higher-ranked No. 7 StFX X-Men (who were 6--2 during the regular season, but picked up a 33-10 win over the Acadia Axemen in last week’s conference semifinal) who came out on top Saturday. StFX jumped out to a 10-0 lead in the first quarter, but it was only 12-3 at halftime, and it was a 21-6 fourth-quarter advantage for the X-Men that really sealed this one. "I think it was just our mentality in pushing through the entire game and playing the football we've been playing all year." "This game means a lot to us, obviously SMU is a big rival, so to come in and win on their field is big. We started the season a little bit soft then we came out and really played what X football is all about." The X-Men will go on the road next week for the Uteck Bowl, the eastern national semifinal, . There, they’ll face the No.2 Laval Rouge et Or, who continued their unbeaten season with a 14-1 win over the No. 4 Montreal Carabins in the Dunsmore Cup (the RSEQ championship) Saturday. RSEQ Cup 3 swimmers of the meet! The first recipients of our prestigious horse heads. A great competition for the Gee-Gee’s! One of the most notable stories in men’s hockey came in a rather lopsided game. That took place Friday, where the No. 6 StFX X-Men (last year’s national runners-up) fell 8-1 to the No. 1 UNB Reds. UNB hosted the University Cup national championships last year, finishing third after an overtime semifinal loss to their AUS rivals at StFX, and they got some revenge on the X-Men at home Friday. The first period in this one was scoreless until the 18th minute, when Tyler Boland opened the scoresheet for UNB. Chris Clapperton added a second in the seventh minute of the second period, and the Reds really took off from there, scoring three further goals between the 14th and 16th minutes of the second (with the latter two coming only nine seconds apart). UNB then added two more tallies in the third before Matt Needham pulled one back late for StFX, and Oliver Cooper capped the game off with another Reds’ goal. Clapperton had a great day for UNB, finishing with one goal and three assists. The Reds then capped off a nice weekend with a 7-0 win against the Dalhousie Tigers Sunday. Blow out your bugles over the rich dead.